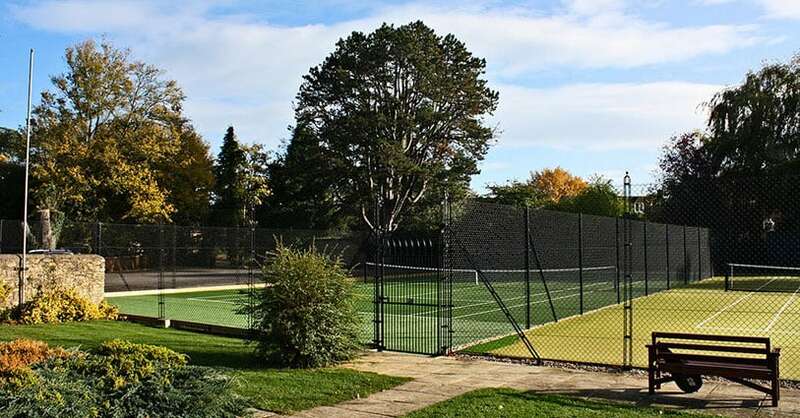 Our tennis court fencing systems are designed to look good from close up and to blend harmoniously into their surroundings from a distance. Building high quality tennis courts that will last and play beautifully for years is only half the story. 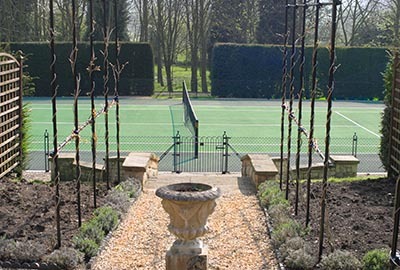 It’s important to landscape your court into its surroundings, and to frame it with an attractive fencing system. 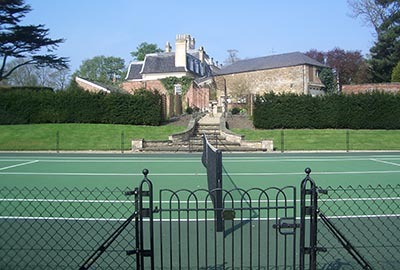 En-Tout-Cas offer two top-quality fencing systems for tennis courts: Estate or our patented Obelisk system - available only from En-Tout-Cas. It was our dissatisfaction with the aesthetic appeal of the available fencing that first led us to develop and patent our own tennis court fencing. En-Tout Cas’ Obelisk concept provides a support for colourful climbing plants, and brings grace and elegance to the playing environment. These court surrounds will transform your court's environment. The obelisk system of tennis court fencing is attractive and unobtrusive. Its slender Gothic stanchions are easy on the eye. The frame also gives all the strength required to withstand severe storms. The result is a tennis court that blends seamlessly into its surroundings. To avoid the box-like effect of angle iron, the surround heights can also be varied - for example with a high back and low sides. This further enhances the aesthetic appeal of the surrounds, giving uninterrupted lines of sight and enabling spectators to have a clearer view of the match. 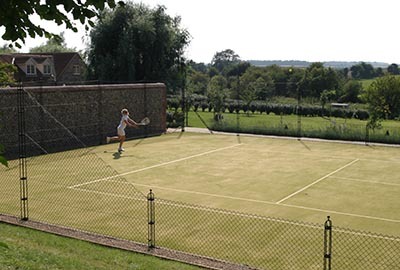 The whole experience of playing on a garden tennis court is enhanced. From a distance the Obelisk fence is hard to see. Alternatively, you can choose our Estate Fencing System, which uses sturdy high-quality fence posts with ball caps for country estate elegance. Our Estate tubular fencing is a superior quality product. It is made from 48mm diameter thick wall tube for gate and corner-posts, and 42mm diameter thick wall tube for intermediate posts. All posts are galvanised, etch primed and painted green or black. Tube is far stronger than traditional angle iron, and can, like obelisk, be concreted to full depth and provide foundation for the edgings. Ball finials on tube fencing can give a look of estate fencing. The double-size practice wall pictured above blends beautifully into its surroundings. What's more, its structure works much better as a practice aid. It gives a more realistic response, angle and speed than an old-fashioned concrete wall. With a little thought and ingenuity it's possible to use your tennis court for other sports. In the process, you can save space - and money, compared to the cost of creating separate structures. The video shows a cricket practice net on an En-Tout-Cas Savanna court. 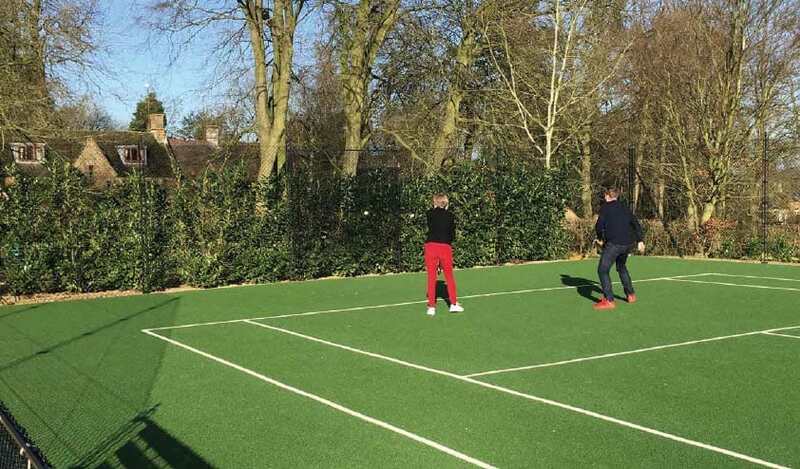 The addition of a soft net surround, just outside the lines of the tennis court, but inside the court fencing, created a space for a cricket practice net. 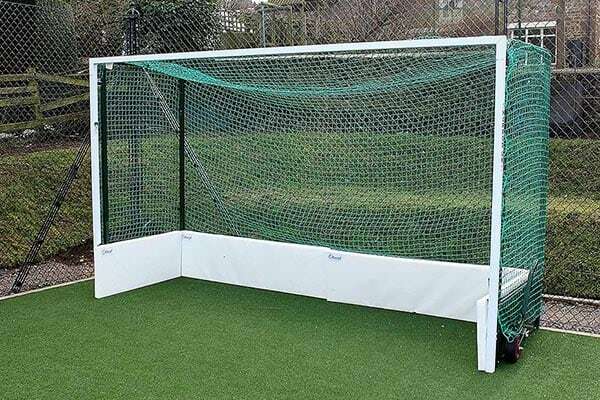 This space-saving idea is unobtrusive and saved the £10,000 cost of laying a separate surface for a cricket practice net. Installation is quick and easy.